We are really pleased to announce that Categorical Books has designed its first CD package. 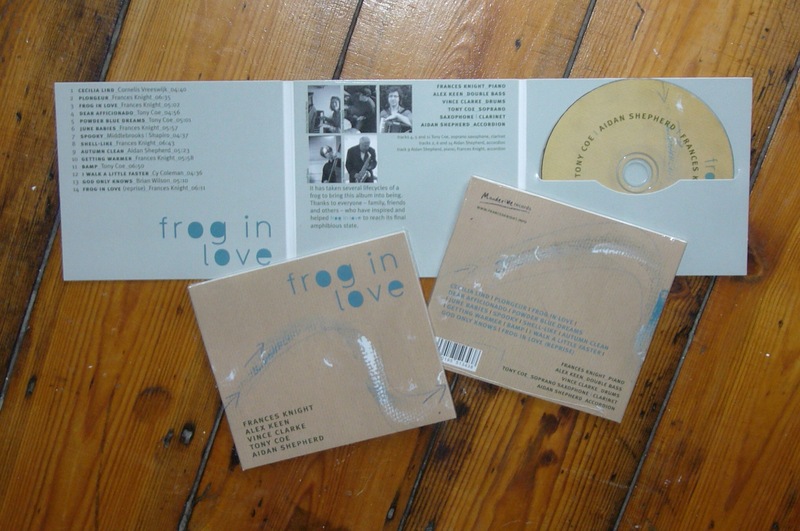 frog in love, by pianist Frances Knight, features double bassist Alex Keen, drummer Vince Clarke, Tony Coe on sax and clarinet, and Aidan Shepherd on accordian. It’s a mix of Frances’ own compositions, plus tracks by Coe and others and new interpretations of pop classics such as the Beach Boys’ ‘God Only Knows’. Mischa Pearlman describes it as ‘an evocative and enchanting album… that’s touching, tender and thoughtful.’ We particularly like the title track, which has the same playful wit and charm as the character in Max Velthuijs’ children’s book series, which provided inspiration. You can buy the album at www.francesknight.info or by clicking here. Highly recommended!